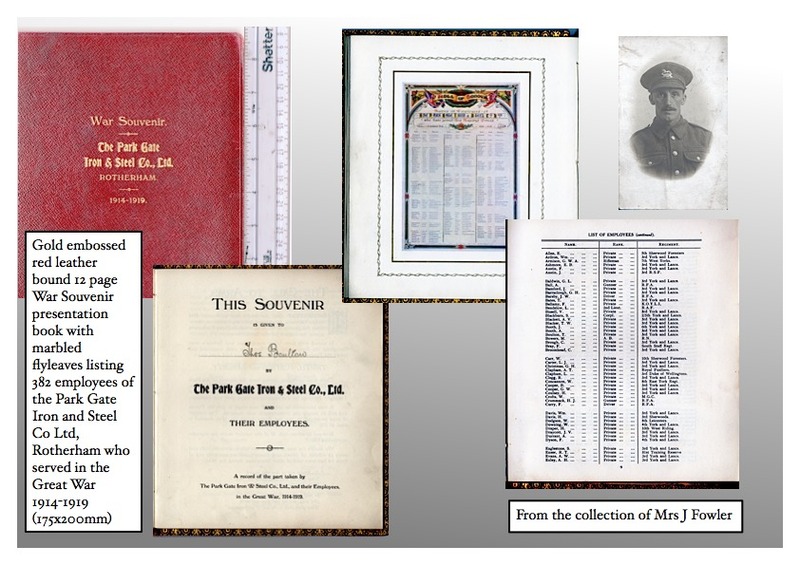 1st World War Memorabilia and newspaper clippings relating to the Boulton brothers of Rotherham and The Park Gate Iron & Steel Works Co. Ltd., from the collection of Mrs J. Fowler. Includes a gold embossed red leather bound 12 page ‘War Souvenir’ presentation book with marbled flyleaves listing 382 employees of the Park Gate Iron and Steel Co Ltd, Rotherham who served in the Great War 1914-1919 (175x200mm). This page was added on 20/01/2016.